The University of Vermont (UVM) hosts annual travel study classes to Batey Libertad and other communities within the Fundacion de Libertad alliance. Trips are organized around service-learning projects that have emerged from community priorities and in cooperation with NGO partners such as Grassroot Soccer, the Dominican DREAM Project, and the Batey Relief Alliance. 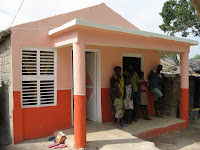 The first class in January of 2005 initiated the Grassroot Soccer HIV/AIDS curriculum and raised money to help build a local health clinic and school/community center at Batey Libertad. 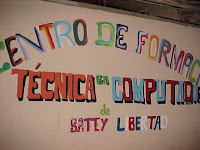 Subsequent classes completed construction of “el local”, created a computer center for teaching basic computer literacy, provided laptops to high school and college students who are sponsored by Education Across Borders, supported activities of batey women’s groups, organized community health clinics, built homes for families at Batey Libertad, and helped to expand the Futbol para la Vida HIV/AIDS prevention education program to many new communities. The UVM program also supports other service-learning initiatives in the DR, including a June 2007 trip from Urbana High School of Illinois who built a family a home at Batey Libertad; a July 2007 HIV/AIDS program for street kids in Puerto Plata organized by Project Esperanza of Virginia Tech; and an upcoming March 2008 alternative spring break trip from Dartmouth College that will be building a community center in Saman (the north coast center for Futbol para la Vida HIV/AIDS education programs). The 2007-08 academic year will include three new UVM service classes. During the November 2007 Thanksgiving break, Jon and Pat Erickson will lead a trip to Batey Libertad to support new HIV/AIDS programs, a community health clinic, the formalization of a language literacy and tutorial center, and the beginnings of a new community gardening project. Over the January 2008 winter break, John Hayden of Plant and Soil Sciences will lead a trip to establish community garden plots at Batey Libertad, leaving behind a student volunteer to coordinate a community farm and literacy program during the spring semester. Then over the March 2008 spring break, McKew Devitt of the Department of Romance Languages will bring a group of students to work on the literacy program, a new community library, and replace more “tin can” shanties with ventilated block constructed homes. For more information on service-learning trips and community collaboration opportunities, please contact Jon Erickson at jon.erickson@uvm.edu, or 802-656-3328.